Remedial Massage works on soft tissue to release areas of contraction & pain. A variety of movements are used to warm & relax effected areas, improve circulation, work deeply into muscle tissue, relieve congestion and spasm & remove waste products held in the tissue. Clients are left feeling freer & lighter with reduced pain and a feeling of relaxation. Remedial massage is recommended to target specific physical issues such as sore neck & shoulders, headache, back & leg pain and to facilitate relaxation & wellbeing. Thai Massage uses pressure points & stretching movements to effect the entire body. This results in an ‘opening’ of the body that improves flexibility & assists in alignment & postural integrity. Thai Massage releases both deep & superficial tension & helps the body’s natural energy to flow more freely. It is both relaxing & revitalising. This style of massage is performed on the floor using a thin but supportive futon mattress. Clients remain clothed in light comfortable attire as they would for a yoga session or exercise. Hot Stone Massage is a deeply relaxing restorative treatment using gently heated smooth volcanic stones. The heat held in the stones soaks deeply & evenly into muscles, pressure points & energy centres to melt & soothe away tension & pain. Taking relaxation to another level. 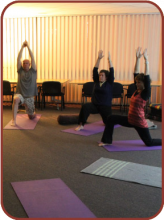 Yoga brings together physical movement, breath awareness, relaxation/meditation. Practiced in combination these elements have a profound & unifying effect on body & mind. Yoga promotes strength, flexibility, healthy functioning of all body systems, positive thinking & a strong sense of peace & wellbeing. Small classes encourage students to work to their own potential in an environment of exploration, friendship & goodwill. For those who have specific physical challenges or need more personal attention private sessions are available.